Lawrence Jay Duplass (born March 7, 1973) is an American film director, author, and actor widely known for his films The Puffy Chair (2005), Cyrus (2010), and Jeff, Who Lives at Home (2011), made in collaboration with his younger brother, Mark Duplass. Duplass stars in the Amazon Video comedy-drama series Transparent (2014–present), and co-created the HBO comedy-drama series Togetherness (2015–16). Duplass was born in New Orleans, Louisiana, the son of Cynthia (née Ernst) and Lawrence Duplass. He was raised in a Catholic family, and attended Jesuit High School. Duplass graduated from the University of Texas at Austin with an MFA in film. Duplass is of part Cajun ancestry. Duplass attributes much of his and his brother's love for film to his appreciation for Raising Arizona. In an interview with Robert K. Elder for The Film That Changed My Life, Duplass speculates on what might have happened had he not seen the film in his youth. I probably wouldn't be making movies—seriously. It held over for so long. It really was the root of everything that Mark and I always hold ourselves to in making movies. That is to say that Raising Arizona is the most inspired movie that I have ever seen. In 2014, he starred as Josh Pfefferman in the Amazon Prime Original Comedy-Drama Series Transparent, alongside Jeffrey Tambor, Gaby Hoffmann, Amy Landecker and Judith Light. The series was met with widespread critical acclaim, earning 11 Primetime Emmy nominations, including nominations for Best Comedy Series and Best Actor in a Comedy Series for Jeffrey Tambor. In the second season of the show, Duplass' role became more prominent, and he was nominated for the Critics' Choice Television Award for Best Supporting Actor in a Comedy Series. Prior to Transparent, Duplass had never acted in a featured part. He was talking with director Jill Soloway at a dinner party about the difficulty they were having finding an actor to play what would end up being Duplass' role. After suggesting many actors for the part to Soloway, Soloway turned to Duplass and told him that he should play the part. 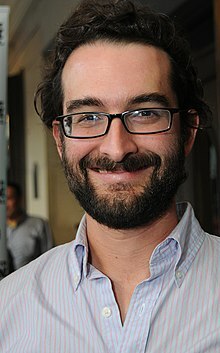 ^ "Jay Duplass - United States Public Records". FamilySearch. Retrieved March 11, 2015. ^ "Low budget and brotherly". Los Angeles Times. July 3, 2006. Retrieved April 2, 2013. ^ King, Susan (July 6, 2006). "Puffy Chair carves out a living". Newsbank.com. ^ "Mr. John Anthony Ernst, Jr. obituary". Stei-23818.tributes.com. Retrieved April 2, 2013. ^ Hood, Shannon (March 19, 2010). "SXSW Interview: 'Cyrus' Directors Mark and Jay Duplass". The Flickcast. Retrieved April 2, 2013. ^ "Jay Duplass Talks Moving To The Mainstream At The 2011 Savannah Film Festival". Indiewire. March 2, 2012. Retrieved April 2, 2013. ^ Kelly, Christopher (July 2012). "Sibling Revelry". Texas Monthly. ^ Lamble, David (March 28, 2013). "The Bay Area Reporter Online". Ebar.com. Retrieved April 2, 2013. ^ a b Elder, Robert K. (2011). "Interview with Jay Duplass". The Film That Changed My Life. Chicago: Chicago Review Press. p. 209. ISBN 9781556528255. ^ Lincoln, Kevin (6 January 2016). "After Years Directing Indie Films, Transparent Star Jay Duplass Found Himself in an Unlikely Place: In Front of the Camera". Vulture. Retrieved 6 January 2016. This page was last edited on 26 February 2019, at 01:24 (UTC).